Many years ago, when a doctor or dentist made a recommendation, the patient almost always accepted their expertise and proceeded with the procedure. A lot has changed since then. With the advent of the internet, patients may even want to go home and do their own research before making a treatment decision. One of the reasons patient hesitate is because they feel the doctor will benefit financially and feel they must look out for their own self interest. In training dental offices, you probably already used the phrase co-diagnosis to describe the process where the patient is guided through a self-discovery of their problems. Technology now helps us tremendously in this process, using digital photographs, intra-oral cameras and digital radiographs. I like to take digital photographs early in the examination appointment so that the photos can be uploaded and the patient can see their actual conditions and begin owning their problems before the doctor performs his/her exam. Most patients expect far less problems than are actually present. By seeing the evidence first hand, their self discovery improves case acceptance. Do you see anything you're concerned about? Is there anything you'd like to change about your smile? As the team member guides the patient through co-diagnosis, dental office scripts and analogies provide a great way for dental assistants to explain obvious dental situations to patients. Patients understand analogies, or so-called word pictures better than straight facts. I saw this, as dental assistants worked with me for several years, they were using the same word pictures that I use. When we finally realized that new dental assistants could learn the same scripts more quickly if they were in written form, it first met with resistance because it was difficult to memorize the scripts. When we added the scripts to StreamDent software so that the dental assistant could be able to glance at the script on a tablet computer or a monitor behind the patient, their use increased dramatically. Below is an example of a script we use during the examination process. 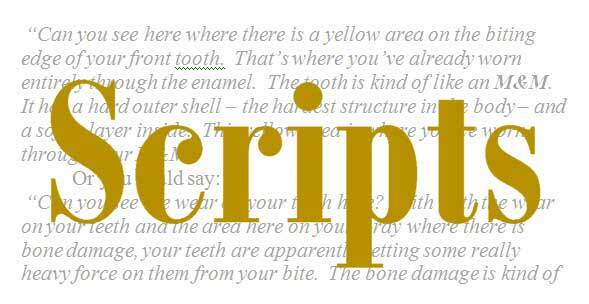 To see the script we use for our new patient office tours, click here. 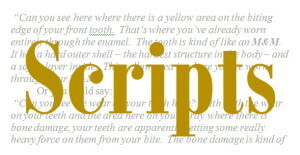 As a consultant, you know scripts are a valuable tool that are too often unused. It's difficult to get team members to memorize scripts where they can be used effectively. I invite you to look at how using StreamDent, the ultimate dental SOP manual, can overcome those problems. You can reach us at 502.509.1570.